Well matched for beauty and brilliance, this pair of 14K white gold diamond stud earrings contain 2 round brilliant cut diamonds totaling 0.25 carats, G color SI1 clarity. Well matched for beauty and brilliance, this pair of 14K white gold diamond stud earrings contain 2 round brilliant cut diamonds totaling 0.25 carats, G color SI1 clarity. 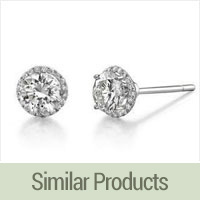 These simple diamond stud earrings will become a staple in her jewelry collection. From the office, to home and a night out in T-town, her new diamond studs are perfect to wear with anything. 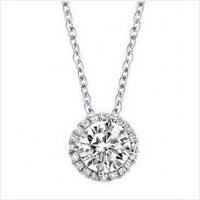 Shown in 14K white gold, available in yellow gold at no extra charge. Every pair of Fincher & Ozment diamond studs are hand selected for matched brilliance and sparkle.Trade In Trade Up – When you trade in your current pair of Fincher & Ozment diamond studs, you will receive the full purchase price you paid as a credit against the new pair of diamond studs you select from us. For example, if you trade in the pair you paid $399 for the new larger pair at $499; the difference is 499 + $44.91 (sales tax) = $543.91 less $399 = $144.91. Present her the new pair of larger diamond studs and bring in the trade in after the occasion so she does not suspect bigger diamond earrings.